Yellowstone. Glacier. The Grand Tetons. Upon hearing these names, the mind’s eye immediately summons the sweeping vistas and abundant woodlands of America’s most beloved National Parks. Every year, millions of visitors become inspired by the best that the nation’s natural resources have to offer. Yet, most of these outdoor adventures are punctuated by indoor experiences: each park’s visitor centers, shelters, and lodges serve crucial functions as interpretive gateways to national treasures. Their neutral colors and rugged but understated shapes echo the geometry and materiality of surrounding landforms. This harmoniousness is the result of a deliberate stylistic choice that was first made as part of the architectural movement known as National Park Service Rustic. The National Park Service was founded in 1916, when the expanses of untamed wilderness across the US could only be conquered by locomotive. Before then, most park infrastructure was simply utilitarian, erected quickly with minimal attention paid to aesthetics or relationship to the landscape. Some exceptions, such as Yellowstone National Park’s iconicOld Faithful Inn, were built from primarily site-sourced timbers that created a distinctively playful and rustic appearance that came to be associated with lodges. Once the NPS took over, more park buildings began to adopt this picturesque sensibility, shaping roof lines to complement regionally specific environs and utilizing materials sourced locally to park lands in a tradition that came to be called National Park Service Rustic. Round timbers in particular continued to dominate this early lodge aesthetic, their biomorphic appearance recalling the beauty of the sprawling national forests from which they came. St. Mary’s Visitor Center, one of two Mission 66 projects in Glacier National Park. By the 1950’s, a dramatic increase in traffic necessitated a more structured national park experience due to improved accessibility in the age of the automobile. The parks’ pre-WWII facilities could not accommodate postwar guest numbers, and the delicate balance between commercial activity and the natural environment was at risk. In response, the NPS launched Mission 66, a program intended to build and renovate national park infrastructure to meet this demand. From 1955 to 1966, over 100 new visitor centers were built alongside countless parking lots, shelters, and campgrounds. The Mission 66 project aesthetic was the product of a national reawakening of interest in nature, combined with the mid-century predilection towards clean lines and sleek profiles. Timber and stone remained the primary materials used, but glass and concrete - novel introductions to the building industry at the time - were increasingly incorporated as well. Big names in the Modernist movement such as Taliesin Associated Architects and Richard Neutra brought this “Parkitecture” out of the realm of “Park Service Rustic” to "Park Service Modern”, establishing a new architectural typology from the foundation built by previous Park Service structures. Inside the Craig Thomas Discovery and Visitor Center. Over 50 years later, the architecture of parks is once again undergoing a paradigm shift. More than ever, natural resources such as site-sourced timber can easily integrate with advanced materials such as steel, concrete, and engineered wood to bring their timeless strength and beauty to 21st-century applications. With concerns about national parks’ sustainability mounting as visitor numbers climb, park infrastructure must now minimize its carbon footprint on the environment, as well as its visual impacts on its surroundings. Now that sustainability is a core facet of contemporary building design, the use of round timber - a visually expressive, renewable material with low embodied energy - is also seeing a resurgence. 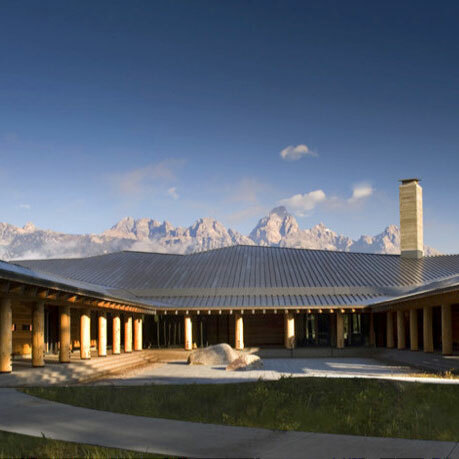 Grand Teton National Park’s Craig Thomas Discovery and Visitor Center, completed in 2007, blends the natural strength of beetle-kill pine round timber columns with the high-tech sensibility of floor-to-ceiling glass curtain walls. The 23,000 sq.ft. interpretive center’s mix of structural systems allows views of the park’s stunning geography to take center stage among supplementary exhibits and services, blending primality with modernity to enhance the natural environment instead of attempting to tame it. Departure hall at the Jackson Hole Airport. Integrating timber with advanced materials such as steel and concrete transforms a once-rustic look into an elegant design solution, which can be seen even in buildings with non-traditional uses. One example is Wyoming’s Jackson Hole Airport, the only commercial airport in the United States sited within a national park. Originally constructed in the 1930s, this gateway to the Teton Range underwent a 110,000 sq.ft. renovation in 2010 to meet high-performance requirements while maintaining the Tetons’ historic character. Standing a modest 18 feet tall against its stunning mountain backdrop, the LEED Silver facility utilized FSC-certified timber with regional and recycled materials and low-emitting finishes. Its 24” diameter round douglas fir columns became an elegant design feature in juxtaposition with a sophisticated steel and glulam truss system, resulting in a contemporary aesthetic that honors the hand-crafted lodges comprising its lineage. By necessity, the architecture of state and national parks has evolved throughout the years in order to accommodate rapidly increasing programmatic and structural demands on park infrastructure. This phenomenon was witnessed through the improvements facilitated by Mission 66, and can be seen again in the resurgence of modern biophilic design in new interpretive buildings that modernize the original National Park Service Rustic while still recalling its heritage. With architects and planners facilitating deeper connections with nature through combining historic materials with 21st-century aesthetics, sustainability, and performance, the future of Parkitecture is headed on an exciting trajectory.